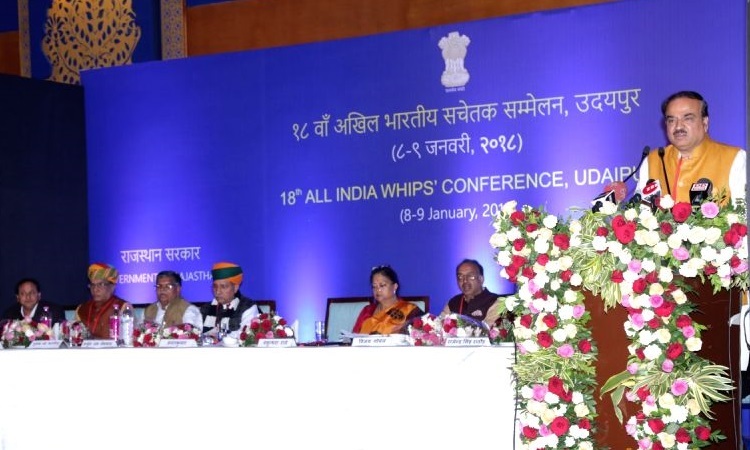 The 18th All India Whips’ Conference was inaugurated by Shri Ananthkumar, Union Minister for Parliamentary Affairs and Chemical & Fertilizers today at Udaipur, Rajasthan on 8th January 2017. Chief Minister of Rajasthan, Smt. Vasundhara Raje Scindia, presided over the inaugural session as the Chief Guest. The two-day conference is hosting around 90 Delegates belonging to 19 States and Centre. The conference will conclude on 9th January, 2018. In his inaugural address, Shri Ananthkumar informed that the duty of a Whip is not only to monitor the Members of the party in Legislature but also to moderate and motivate them. He compared the Whips Conference to twin Rainbows – Rainbow of various Political Parties and Rainbow of various States and stated that Parliamentary Democracy is the best form of democracy. The entire purpose of this conference is to strengthen the parliamentary democracy, its institutions and ultimately serve the people at large, the Minister added. The conference provides a platform to Whips of various political parties – ruling as well as opposition at the Centre as well as the States to exchange their views and experiences and discuss the challenges facing them in discharge of their Parliamentary duties and evolve norms for efficient working of parliamentary machinery.